Confession 2: I’ve owned this book for almost 6 months now. I ordered it along with “The Subtle Art of Not Giving A F*CK” in like…. April. It took me until late August to finish Subtle Art and then I decided my next project would be to study “The Subconscious Mind” given what was happening to me when I wrapped up Subtle Art. Confession 2: I’m only about 30 pages into this book as we speak. I read the forward and a bit of Chapter 1. It doesn’t make me a candidate for a full book review, but I don’t think that this book requires that at all. The IDEA: That what makes a successful person is not the amount of things that he or she is able to get done in a day, but the amount of meaningful and important tasks that someone accomplishes in a day. The most important tasks are not necessarily the LONGEST tasks or the BIGGEST tasks. HINT HINT. The book suggests to highlight the 3 most important tasks of the day and assign “deadlines” to them. For example, “Cold Call 3 clients” by 11am. So I decided to take a crack at Lesson 1. My Current Method: To-Do list. Separated by AM/PM or my daily workout. Similarly, I tried to tackle the most important tasks first. But they wound up usually being the biggest and most draining tasks for me. I felt that if I did them and got them over with, it would be a relief and then I could move on to the quick and easy tasks. However, this method was failing me and I knew it. For starters, it was draining on my energy and those small, easy tasks were the first to continually get pushed back and procrastinate on. Second, it gave an unrealistic picture of just how much time my list took and that contributed to stress and rushing. Sometimes I felt like a long to do list meant a sharp 7am start to my day and a 5pm or later finish. I felt like it meant I couldn’t take on any more tasks, I couldn’t make plans to be anywhere at any point during the day, I couldn’t run and get food if I needed it and I couldn’t run and get coffee if I needed it. I had previously worked on a time-blocking technique that I briefly spoke about in this blog post. However, I found with at least 50% of the type of tasks required of me being RE-ACTIVE to my email (answering leads, setting up and having calls and responding to client emails in a timely manner) that the minute I interrupted a time block with a call, my whole day still felt off and I still felt like I didn’t have enough time the day. Lastly, I found that with time-blocking techniques or crossing off TO-DOs you didn’t make “plans” to work on Non-Urgent/ Non-Work Related projects (like updating your blog or website. Those things that I need to do to stay sane.) If there was time in my day, I actually either wasted time trying to figure out what to DO with my time, or… really wasted time reading articles on LinkedIn, posts on Facebook or other things (not like they aren’t GOOD things, but they need to be managed). Though the book suggests not doing it at the END of the day – I waited until almost the end of my day to then plan my next day out completely with times, making sure to assign deadlines to the three most important tasks. So my planner started to look something like this the night before. 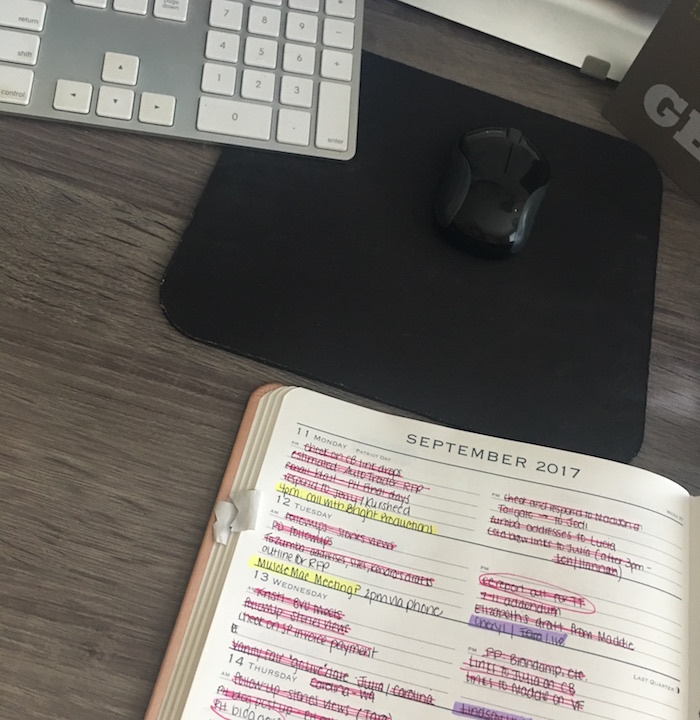 My highlighted and bolded tasks are most important to my success while the other tasks associated with a deadline are tasks that are important to be done at that time, on deadline. I had been using the excuse forever that setting up shop at a coffee shop just never worked out for the way I structured my day – and that was damn true. There is a difference between knowing what needs to be done and just doing it – and making a plan for it. In fact, the 20 mins it takes me to travel to a coffee shop could have been wasted in my office in some manner too – leading to the same amount of work done. Not to say that just doing something won’t “get it done” – but making a plan allows you to really maximize the time in your day, which for me – provides stress relief, a clear level head and leads to a more effective use of my time. I’m a proponent of working smarter. There’s the feeling of more accomplishment and a feeling of more control over the day, which for me has given me the ability to make and stick to plans better, accomplish more, not feel guilty about eating breakfast or running for coffee, PLAN to do things on my non-urgent list, and have a better idea of what deadlines I can make. But most importantly, it allows me to integrate work into my life better. I often envy those people with the ability to enjoy a cup of coffee while answering emails or listen to a podcast while on the treadmill or in the car. How nice would it be to do both? We don’t always have to choose. We don’t have to choose between dinner and work – we can pop open our laptop at our local ramen restaurant and do both sometimes. (And savor the taste of our ramen at other times). We can experience new atmospheres and make ourselves more efficient. We hold the power to do so – and part of uncovering that power requires figuring out what the roadmap looks like to help get us there. While I admit I’m still cracking that code, I truly believe small changes to the way that time and work is managed can help…. this did.